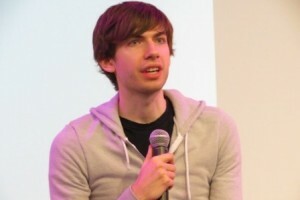 David Karp’s wallet just got a lot fatter. After a flurry of speculation over the weekend, Tumblr in New York is being acquired by Sunnyvale, CA-based Yahoo, in a deal announced early Monday at the previously reported price of $1.1 billion, mostly in cash. Yahoo put out a statement on the acquisition with a pledge to “not screw it up.” The plan is for the Tumblr media network and microblogging site to operate independently with CEO and founder Karp at the helm. For Yahoo, the deal means an expected 50 percent increase in its audience, with the addition of Tumblr’s 300 million unique monthly visitors. Perhaps to mollify critics of the deal, Karp said in the statement that Tumblr is not drastically changing. “Our headquarters isn’t moving,” he said. “Our team isn’t changing. Our roadmap isn’t changing.” He has not yet responded to requests for further comment on today’s deal. For Karp and his investors, the money is surely nice, but it leaves many questions about how Tumblr will evolve while attached at the hip (even if discreetly) to Yahoo. The deal invites comparisons to Facebook acquiring Instagram or Google grabbing YouTube to diversify their reach with the public—and with varying results. Who knows what Tumblr could have become on its own? Now its future is linked to an Internet company that wants to reposition itself. In spite of aggressive moves by CEO Marissa Mayer, Yahoo is still working to show it can be a power player on the Web again. The company reported for the quarter ended March 31 net income of $390.3 million on $1.14 billion in revenue. That compares with net income of $286.3 million on $1.22 billion in revenue for the same period a year ago. Today’s deal could be a positive for the New York startup scene, according to Scott Cutler, executive vice president and head of global listings at NYSE Euronext. “Much like we saw a new ecosystem of startups come about from the ‘PayPal Mafia,’ a major exit of this size in New York could very well result in the formation of a new generation of startups,” Cutler tells Xconomy via e-mail. Since Mayer took over as Yahoo’s CEO last July, the company has been busy acquiring other companies, particularly in the mobile arena. Deals made under her reign include the acquisition of Stamped in New York, a platform for saving favorite things with mobile devices, last October, and news aggregation app Summly in March. Yahoo made those deals with plans to kill each app though and keep the technology. Tumblr may be a new avenue for Yahoo to reach the public—so long as its audience remains with the platform after the deal. Karp spoke recently at Xconomy’s NY Venture Challenge forum about scaling up his company with guidance from investors such as Bijan Sabet, managing partner of Spark Capital, based in Boston. “Tumblr is 170 people, will be 200 by the end of the year. I never worked at a company that big and certainly never ran a company that big. Bijan has,” Karp said during the event. Things just got even bigger for him.